The site is modeled after a Mississippian village, which includes a townhouse set on top a man-made earthen mound, lodges, and a game pole. A protective fence encloses the site. The mound area at Town Creek is a rectangular block 120 feet by 140 feet, encompassing the mound (previously referred to as “Frutchey” Mound after Lloyd Frutchey who conveyed the site to the state in 1937) and the village area immediately adjacent to the mound. About 600 years ago, Town Creek Indian Mound served as a ceremonial center for social occasions and feasts, and the area within the stockade was used for mortuary rituals and burials. Around A.D. 1100, a new Indian cultural tradition emerged in the Carolina Piedmont. Now called the “Pee Dee” by archaeologists, this new culture was part of a far-reaching tradition known as “South Appalachian Mississippian.” In Georgia, South Carolina, and portions of Tennessee and North Carolina, this new culture gave rise to complex societies that built earthen mounds for spiritual and political purposes, engaged in extensive trade, developed craft traditions, and celebrated a new religion. They remained in the Town Creek area until the 1400s. The mound at Town Creek was constructed in stages over an extended period of time. The earliest structure apparently was an earthen lodge. Individual posts set in holes formed its walls. Earth was then piled in an embankment around the walls and over the roof to create the “earthen lodge.” Eventually the structure collapsed, and its remains and the surrounding area were covered to create a low earthen mound. The mound served as a platform upon which a new temple or town house was erected. After that structure burned, its ruins were covered by a thick layer of soil, which further heightened and enlarged the mound. Another structure, identical to the earth lodge that had burned was built on the enlarged mound. The mound at Town Creek faced a large public area where public meetings and ceremonial activities were held. Several structures, including some that served as burial or mortuary houses, were constructed around the edge of the plaza. 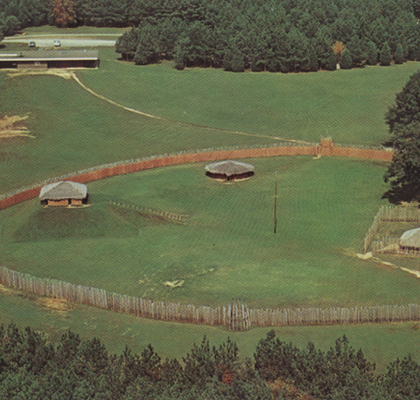 The Pee Dee enclosed the mound, plaza, and village with a stockade made of closely set posts. The construction of the stockade was an ongoing process, taking place in at least five episodes. Five hundred and sixty-three graves associated with the Pee Dee culture have been identified at the site. Most individuals were interred in simple pits with their bodies fully extended. A small number of bodies appear to have been buried as bone bundles. The bodies of several infants and children were wrapped and placed in pottery urns. A few of the Pee Dee individuals were richly adorned with exotic artifacts, such as copper-covered wooden ear spools and rattles, pendants, conch shell beads and pins. Excavations at the site began in the 1920s when local amateur archaeologists began unearthing relics and bones. Beginning in 1937, professional archaeologists took over the excavations. Between 1937 and 1942, archaeological work at the site was supported by the federal government, first through the Works Progress Administration (WPA); then between 1938 and 1939 through the National Youth Administration; and from 1940 to 1942, again through the WPA. From 1945 to 1955, when archaeological excavation of the site was completed, the state of North Carolina funded the project. The property became a historic site in 1955. It is one of the few American Indian sites in North Carolina that is recognized as a National Historic Landmark (a status acquired on October 15, 1966). The mound is located on a high bluff in the middle of the Town Creek site. A ceremonial center is located on top of the mound. The mound sits high on a bluff overlooking the juncture of Town Creek and Little River. The site is used as a tourist attraction. People may come to the site and participate in ritual ceremonies in the temple located on top of the mound.